But we often don’t consider copyright when we look at our professionally taken photos, or go to get them copied. Even though it is so easy to copy an image—with scanners, photo-quality printers, and copy stations—it is still illegal. 65% of photographers are self-employed relying exclusively on photography as their primary source of income. 47% of studios rely on reprints as a profitable source of income. So, as many of you already know - I am a one woman show. As such, I wear every hat possible for my business. A lot of time is spent corresponding with clients, setting up appointments, answering questions and taking orders. One area you could help me in going forward is when you are placing orders, there are ways you can give me information that will speed up the process greatly, so that I can get to editing faster! All proofs - be from a show or a session - are put into SmugMug albums. What I need you to give me is the actual file number. If I have this, it makes it MUCH faster and easier. File numbers for each photo can be found at the lower middle portion of the screen. Please do not send links or screenshots of photos (actually, please note, do not remove proofs for any reason from the proof albums). Sending me the actual file numbers is really what I require to start work! Also, when placing show orders, please note what show the photos are from and what evening you danced in. At any given time, I can be handling up to 12-15 shows from 3-4 different events, so this information is critical. One final note - pricing for performance photos (show photos) do not extend to portrait sessions. 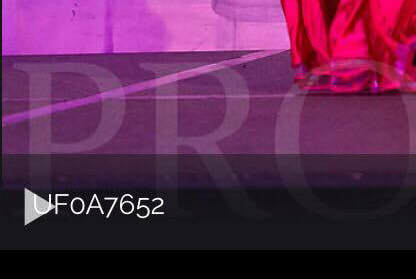 The packages that are offered for performance photos are only for performance photos. All portrait session photos (full, half-hour or mini) include full resolution, print quality, fully retouched files. Prices for those are included in your personal proof links. Helping me help you will ensure that I can get to work on your photos faster and get them to you even sooner. I have written previously about use of photos off the internet in my blog post of September 2016 - FROGNESS or "An Excellent Rule of Thumb for using Other People's Photos", but have been asked several times to break it down a bit further and give some resources as well, so here we go! 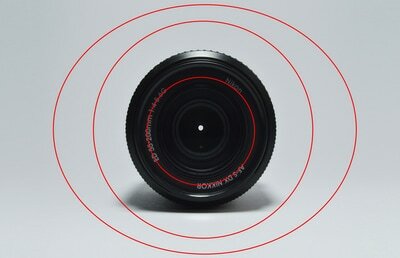 As soon as I snap the shutter on my camera, I obtain the copyright to the image I just created. I own that photo and I can decide how it is used. Copyright is an automatic right. I don’t have to file papers to obtain copyright to a photo I made. I don’t have to use a copyright symbol or use the word copyright when I post the photo on my website; I still own the copyright to my photos. Some people put the words copyright right on the photo to discourage theft. I don’t do that because I think it makes the photo less attractive for my readers. But I still own the copyright. So when you see the word “copyright” or the copyright symbol ©, you’ve been alerted that the photo is copyrighted. But when you don’t see a copyright symbol, the photo can still be copyrighted! If you want to use something that someone else owns, ask them for permission. Some people who post their photos to the Internet might be flattered that you like their photo so much that you want to use it. They may let you use it for free if you to give them a photo credit or to link back to their website. Others will allow you to use the photo if you pay them. Others won’t allow you to use a photo at all. How do you know whether you can use a copyrighted photo from someone’s blog or website? Ask them. Rather than taking a photo from someone’s website or blog, you can find plenty of wonderful photos that you are allowed to use. Some you have to pay for. Some are free, but you have to credit the photographer and/or credit the photo website. You must read and follow the conditions carefully! 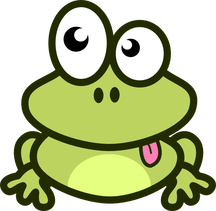 The images are free as long as you stick to the rules in the Image license Agreement. Also, in some cases you may need to notify the artists about using the images and sometimes you need to give credit to them. The quality of the images varies. A morgue file is a newspaper term for the place where they store files after production. morgueFile says its purpose is to provide free image reference material for use in all creative pursuits and to be the morgue file for the Internet. In addition to offering free photos, this site links to other paid sites. You can easily find yourself on one of the paid sites. Photos8 is a paid site with more of a worldwide flavor rather than an American flavor. Photos suitable for the Internet cost $2 each. GraphicStock.com is a subscription-based website that provides members with unlimited downloads of stock graphics, stock images, icons, buttons, backgrounds, textures and more. Instead of charging per download, they allow members to download as much as they want. You can subscribe by the month for $49 or by the year for $588. There is a seven-day free trial. This is a paid site, but it has lots of photos that are geared for blogs and websites. You can buy credits or buy a subscription. I love to use hands in close ups to frame the face or simply add interest to a shot. People tend to forget about their nails, but they do show up in a majority of your photos. Whether you pay a visit to the salon or beautify yourself at home, make sure your nails are ready for their photo shoot debut. Chipped finger and toenails are an eyesore that are difficult to hide, impossible to fix post session and do not allow for a full use of your extremities that can really make a shot! In the weeks prior to your photo shoot, moisturize your hands often and try to grow out any bitten or scraggly nails. A one-color palette is the safest bet. If you are seeking a splash of color (a classic red for example), make sure that it compliments your costuming! If you don’t want any color, just clean, neat nails with a clear or neutral nail polish is absolutely perfect. And…DON’T FORGET THE TOE NAILS! People often go barefoot in a shoot or wear heels with exposed toes. The extra time and attention that you put into making your nails photo ready will pay off in your photos! While at the 2017 ATS Homecoming event in January, I was asked to present a poster session on Thursday night. My chosen topic was on the importance of eye contact during performance. Just like your audience, the camera knows when you aren't looking at it -- and you are going to see it in your performance photos and videos. Eye contact is a skill that needs to be taught and perfected in the classroom - most of us are not born with stage presence. So, here's a bite sized way to start thinking about this important piece of the performance puzzle and the highlights of what I discussed during my poster session. Remember to utilize your eyes while on stage! Try to avoid looking at the leader the entire time and avoiding the audience altogether. Look around and use a mix of gazes. Invite people in to your experience! Use your peripheral vision to watch the leader for cues. You don’t want to look like you are burning a hole in the leader’s spine waiting for that next move. This is key to starting being able to make connection with the audience. Even if you can’t see your audience from the stage - you’ve got to visualize and perform for that one, ideal person. Sometimes it's difficult to make eye contact at all, with the house lights turned off and the stage lights shining brightly into your eyes. But the more time you spend on stage, the easier it will become. 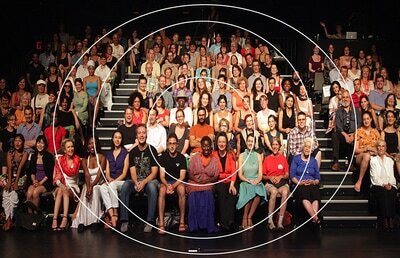 Think about looking into the audience like you are looking into the lens of a camera (see the attached photos for reference). This gives us a ring-shaped area around the camera that respects the taboo of not looking directly at the audience but in which the eyes – the windows to the soul – remain accessible. 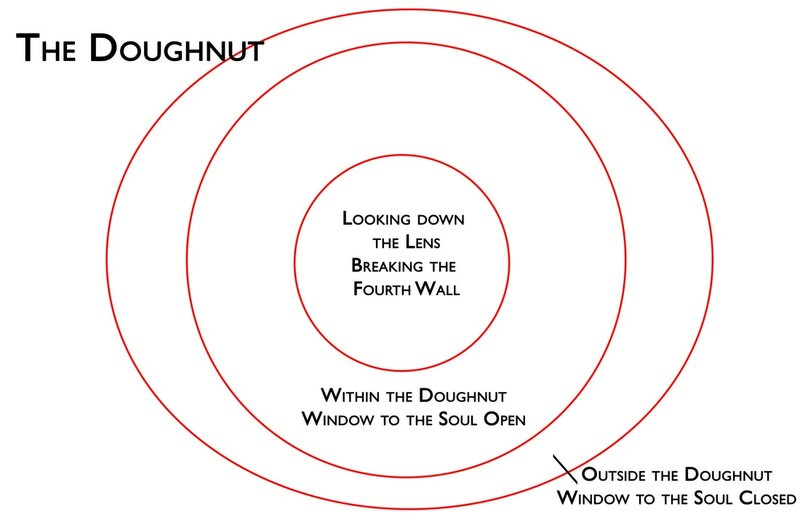 I call this area ‘the doughnut’ and working within it is the key to powerful performance. - Looking down the lens or breaking the fourth wall. This is making direct eye contact with an audience member. This is saved more for the leader or for soloists. 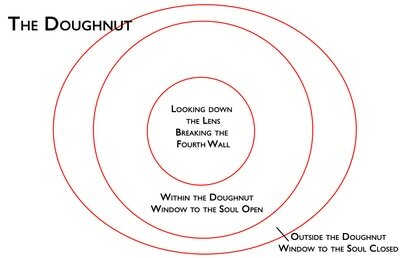 - Within the donut or window to the soul open. This is widening your gaze to extend across the audience. This will allow you to use your peripheral vision to keep tabs on the leader, but still be seen as actively connecting with your audience. - Outside the donut or window to the soul closed. This is averting your eyes to the ceiling, the floor, the far sides of the audience or while you have your back to the audience. It’s impossible to be precise about how large the doughnut is. It will depend on the lighting, the depth of your eye sockets, the prominence of your brow and several other factors that you cannot control. It’s also not a straightforward question of being in or out. Rather, as you look further away from the audience, your eyes become less accessible until, eventually, we cannot see anything meaningful of them. 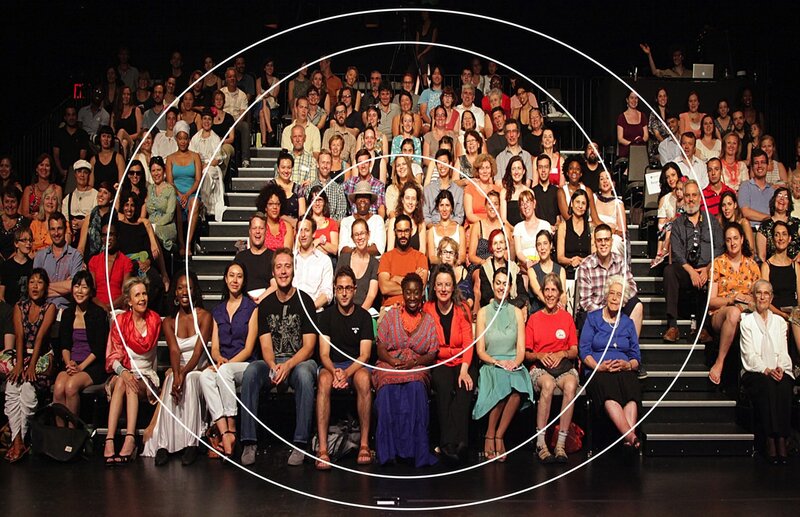 If you are too shy to start off with the “Doughnut,” then at least look directly into the audience, finding a point on the horizon slightly above people’s heads, to make your focal point. 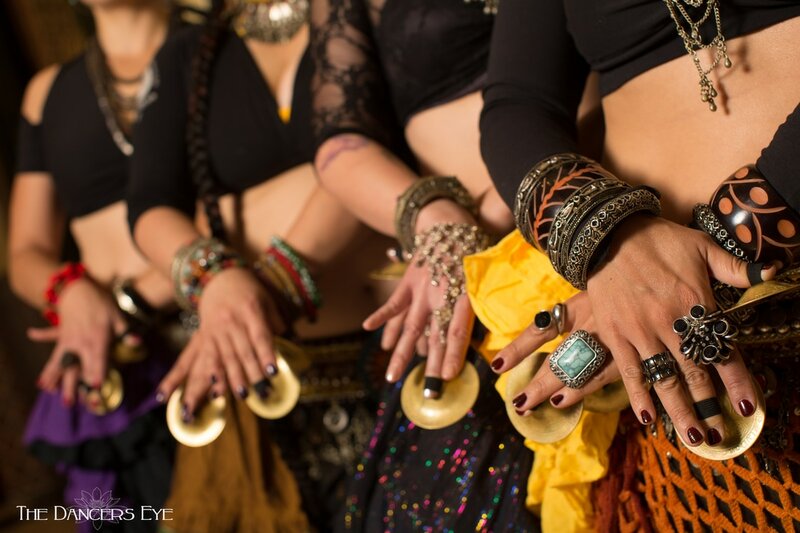 Balancing connection via your eyes with your leader, your sister dancers and the audience ultimately will enrich your performance and give you more confidence on stage. ​While in New York City this fall, I had an opportunity to visit the National September 11 Memorial and Museum. As you can imagine, it is an emotionally difficult place for many different reasons. However, one specific display affected me the most – and the explanation of the cause might be surprising. Located within the original footprint of the South Tower, the memorial exhibition features portrait photographs of the 2,983 victims of the terrorist acts of September 11, 2001, and the February 26, 1993, bombings of the World Trade Center. Note the description above says “portrait photographs” --but the majority of these photos were not portraits. They were snapshots, in most cases, informal photos taken by friends or family members. And even sadder, some of the names were simply accompanied by a blank plaque with a small green leaf– there was no photo of these people at all. Those little green leaves made me incredibly sad. Per a note in the display, this meant there was no photo of that person available for display. No visual memory of this person that perished in one of the most horrible tragedies of our lifetime. Did no one ever take photos of this person? Did they not allow themselves to be photographed? Did they not have a photograph that met the minimal quality of what the exhibit required to display? Whatever the reason, those little green leaves bothered me deeply. So many people talk to me about their fears of being photographed. Seeing this exhibit that lacked so many photos brought this to mind, and led me to a thought --instead of focusing on your insecurities the next time a camera comes out, think of your loved ones, and how much it will mean to them years from now to have photos of you from all the different stages of your life. Because as we get older, the way we hold onto memories of certain moments in time is often through photos—don’t you want evidence that you were there, reveling in the moment? Photographs matter, because they capture moments of our lives as they pass which may seem to have little importance to us at the time. The significance, however, may be profound for others later on, as they search for the person we once were, or the places we once knew. They can be small pieces of a jigsaw that complete the larger picture of our lives. Or fill that blank spot where a little green leaf was.